​Members, vacationers, guests and players of all ages and ability are welcomed. Whether you are a seasoned player looking for competition or a newcomer to the game and just learning to hit, there are many ways for you to play at South Yarmouth Tennis. 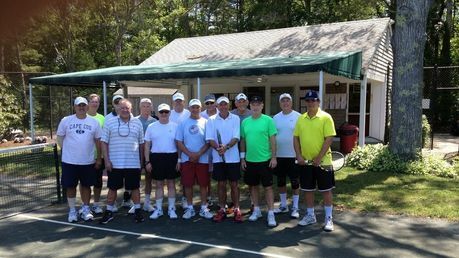 A small sampling of the Mens 4.0 Tennis Group which plays M,W, F afternoons throughout the summer. Are you a summer vacationer or resident who wants to play occasionally? SYTC's drop-in rates are extremely competitive! ($10/person for doubles or $20/person for singles.) Reserve courts day of or up to 2 days before play. ​Call 508 398-2209 for more information and to reserve a court. Click on drop down menu for specifics about vacationers, visitors, short term (weekly) and full season memberships and the many ways to play at South Yarmouth Tennis.